The Futaleufu river is a more challenging river than any river that is being run commercially in North America. It is technical, big and at some water levels, continuous. This river demands knowledge, technical expertise, professional respect and extra caution from company owners and river guides alike, and it requires, wisdom, humility and experience to know when not to run certain sections. It is also one of the most stimulating rivers whitewater rafters will ever descend. Many have called it the "Crown Jewel" of big water rivers. And our numerous Alumni cherish their time rafting in Chile on the Futaleufu as one of their most rewarding river experiences. The Futaleufu river can be run safely with care. Expediciones Chile has been running safe trips on this river since 1986 and has an unsurpassed safety record. Running the Futaleufu River safely over these years is not just luck. It is a relentless expression and application of evolving safety strategies. With all this there is still risk. Since 1993 there have been six drowning deaths on the Futaleufu, four of which were commercial rafting deaths, and two that were kayakers. This river is our life. I have been in working in the river world since 1974 and on the Futaleufu River since 1985. We have evolved many cutting edge strategies ourselves and know many company owners and guides throughout the world that we access for their accumulated knowledge. As the owner, I still kayak this river at least twice a week, so I see firsthand how the river changes with different water levels. I see how the guides respond to the challenges, and to our guests. I make it a point to know whenever we have a raft flip, or a swimmer and why. We deliberately run cautious lines knowing that many of our guests have families waiting for them back home. The Futaleufu river is considered one of the premier guiding challenges in the industry and it attracts the guiding talent reflective of that challenge. 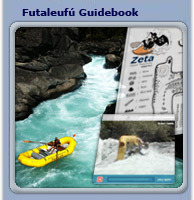 We have resumes coming in from all parts of the world from people who want to work as a Futaleufu river rafting guide. We have always hired guides that are athletic, hard working, and are experienced kayakers and rafters. In addition they love the outdoors and love sharing it with our guests. Expediciones Chile does not tolerate drug use by our guides or “river cowboys” that do not have humility towards the river. To assemble our current guide team we consulted with an associate that we used to teach river rescue classes with. He now works for the insurance industry assessing risks of rafting companies. We asked him which rafting company in all of North America has the best training, safest operation and in his opinion the cleanest cut guide team. He told us about a company called Esprit Rafting in Canada . The owner of Esprit, Jim Coffey has made the continual evolution and innovation of river safety the focus of his life. We invited Jim Coffey down to the Futaleufu and we were impressed. . Jim's off-season is our on-season in Chile. Jim is now Expediciones Chile 's safety leader and runs our state-of-the-art Swiftwater Rescue Technician Class (Rescue 3 International). Jim also runs our Futaleufu River Guide Training each December. We have had participants in this class that are 10 to 15 year Grand Canyon guides. They chose to update their skills and become SWT certified on the Futaleufu with Expediciones Chile. We put our team through dawn to dusk intensive training. We utilize the latest rescue techniques plus all the criteria of Rescue3 International. Our trainees row all the different craft and learn all the routes and dangerous spots on the river. We review the twenty years of history and knowledge that Expediciones Chile has accumulated about this river. We instill in our guides that the first line of defense is judgment and second is being on the correct route. Our swiftater safety instructional team has been officially commended by regional government authorities in assisting the local municipal authorities with river rescue. We have one of the most intensive and complete safety presentations in the industry, before we jump into the rafts with our guests. You will also participate in a simulated raft flip drill before we enter the rapids. You will understand how the back-up safety team will come to your help in case of a swim. We scout the bigger rapids and your guide will explain exactly what to expect on the rapids that do not need scouting. You are continually reminded that you have the option to walk any rapid that you do not feel comfortable with. We take a graduated approach to the difficulty of the river. We run the easy sections first so you can develop your skills and comfort as we experience the more challenging sections. Trip Leader: Your trip leader is responsible for the overall safety of your group. He / or she makes the final decisions if a section of river or rapid will be run. They choreograph the on river guide team. Raft Guide: Your raft guide is the leader of your raft group and is responsible for meshing the individual members into a dynamic team. They will keep you on the right line and out of trouble. Safety Catarafter: Our safety cataraft is an extra rescue platform in case of swimmers or flips. The safety cat can move back and forth across the river to rescue multiple swimmers and carry them back to the righted raft and/or towards shore. The safety cat is extremely stable and agile, and this guide is always waiting. Safety Kayaker: Our safety kayaker, as the most flexible rescuer, can get to any little nook in the river. He can even get out of his boat and carry it upriver and get back in if necessary. The safety kayaker can tow you back to your righted raft or towards shore and can offer face-to-face instructions as what to do next. All of our Chile rafting trips take place on remote rivers in extreme places. The equipment we choose for rafting in Patagonia has to be the best and stand up to rigors of the Patagonia rafting environment. Since there is no store nearby to replace broken or substandard equipment Expediciones Chile selects only the best gear availabale for our Futaleufu rafting trips. Rafts: Our rafts are custom designed to our specifications for rafting in Chile on the Futaleufu by Maravia Rafts of Boise, Idaho, and by Aire Rafts of Boise, Idaho. These are top-of-the-line self-bailing rafts with foot cups and complete safety rigging. Life Jackets: Our life jackets are US Coast Guard approved and imported from the USA . Currently we are using: America 's Cup Ultra Float Class V 100W Lifejackets - one of the most expensive and durable commercial lifejackets available – with a massive degree of floatation (25 lb., 14 oz.). Oars: Our oars are supplied by Advanced Composites of Salt Lake City, Utah which also makes equipment for the aero-space industry. CATARACT® OARS have over twice the breaking strength of aluminum (yet 40% lighter) and without the maintenance required of wood... these oars are made to take you anywhere...again and again! Helmets: Our helmets are ANSI approved and supplied by Whitewater Research and Safety Institute of Salt Lake City, Utah . Each year we go to the Outdoor Retailer Show in Salt Lake City to check out the improvements in equipment and see if anything new could give us a continued edge on our Patagonia rafting trips. Expediciones Chile has been running trips in Patagonia, Chile and down the Futaleufu since 1985 without major incidents or injuries. We have an unsurpassed record of safety in the whitewater industry and we intend to continue to diligently pursue all aspects of safety.